Noticed a small green frog hiding in the leaves of a canna lily. This is my first submission ever to this website and I hope to learn from my mistakes, all constructive criticism is welcome. Thanks to everyone who voted on or even just viewed my submission. I really learn a great deal from other peoples pictures and comments. The picture did better than I had hoped, so I'm very happy. Thanks again and I'm looking forward to more "learning experiences". Great capture, I think it is underrated. Anyway, congratulations and welcome to DPC. You were robbed! I had this one winning the blue. I like the subtlety of the color changes. Best of the frog photos, hands down. Beuaty, Love how the eye is led right into the frog. The bright yellow spot looks a bit oversaturated. Total cool! I hope this dose well for you! Good luck! 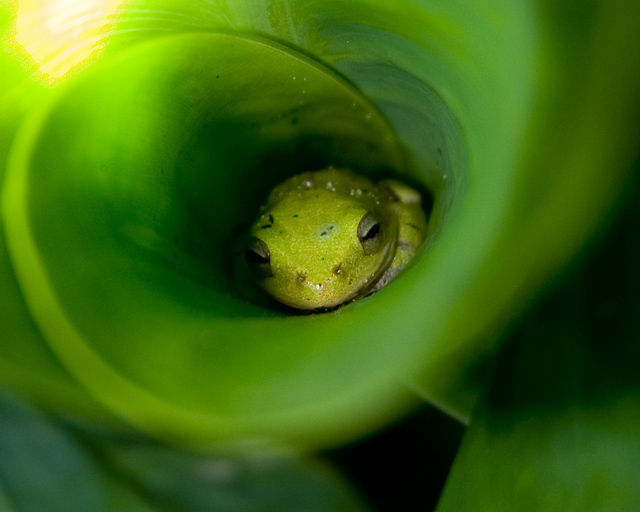 Deep inside the green leaf. A lucky find or a clever setup! The yellow in the top left corner is a bit distracting, but otherwise it's a very interesting photo. Great photo. Awesome nature shot! Well done. He looks tired, leave em alone. LOL. Nicely done. I'm not sure I like the top left yellow, and the bottom right void. Still a very nice photo. Proudly hosted by Sargasso Networks. Current Server Time: 04/22/2019 06:22:53 PM EDT.